Dunwoody College has a long history of helping veterans gain the skills necessary to transition to a civilian career. Our hands-on, applied approach tends to be familiar and valuable to those who have received military training. The College has also played a role in training citizens for military service during time of war. More than 14 percent of our current students are veterans. Learn about the admissions and financial aid process for veteran and military students. 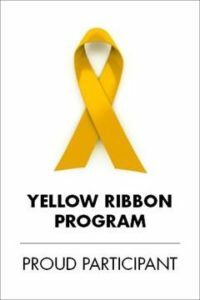 Includes information on military educational credit, the yellow ribbon program, and orientation. Note that Dunwoody also waives the application fee and enrollment fees for Veterans and military students. The College’s Veteran & Military Student Center is located in Black 34. Veteran and military students are welcome to stop by for resources, study and fellowship. A focal point in the Center is a banner, which was the idea of currently serving students. The banner displays the unit patches of veteran and military students. If you would like to add your patch to the banner, please contact Kelli Sattler, Dean of Students, at ksattler@dunwoody.edu. The Dunwoody Veteran & Military Student Organization’s mission is to provide true and unwavering support for current service members and veterans. The organization meets monthly during the academic year. If you’d like to be involved, there’s no formal need to join – simply show up at one of the monthly meetings. In addition to the Veteran and Military Student Organization, Dunwoody has a Veterans Affairs Team, which oversees the College’s continuing efforts to support its Veteran students. The Veterans Affairs Team is comprised of representatives from Marketing, Admissions, Student Success, Student Services, and Academic Administration. If you have feedback or ideas for the team, please contact Kelli Sattler at ksattler@dunwoody.edu. Duane Bauer, Central Metro Regional Coordinator for the Minnesota Department of Veterans Affairs/Higher Education Veterans Programs, is on the Dunwoody campus the first Monday of every month from 10:30 a.m. to 2:30 p.m. Look for his table across from the Accounting window near the cafeteria. The Elftmann Student Success Center, found on the Black Level in the Carlson Commons, offers a variety of resources for individual learning needs, including one-on-one tutoring, peer-supported study sessions, online instructional videos and more. For details, visit the Elftmann Student Success Center website.